Why did my tree suffer storm damage and my neighbor’s did not? Storms do not cause tree problems, they reveal them. Trees falling in thunderstorms are common, with the vast majority of these trees having some predisposing factor that led to the failure. Listed below are some of the common tree failures and warning signs to look for. Whole tree failure occurs when the entire tree -trunk, limbs, leaves- all come down. Most of these cases are a result of some root system issue. Conifers and some Evergreens are frequent victims of this type of failure. Dense canopies and foliage act as sails in the wind, couple this with urban site issues, like confined root areas, poor soil, or waterlogged soils and the risk increases. Trees that have had construction or site changes near them, or grade changes, also cause the risk to rise. Trees that used to be growing in a group that are now solo are also susceptible to failure from strong winds. Trees failing at the soil line can also be related to root issues and other factors. 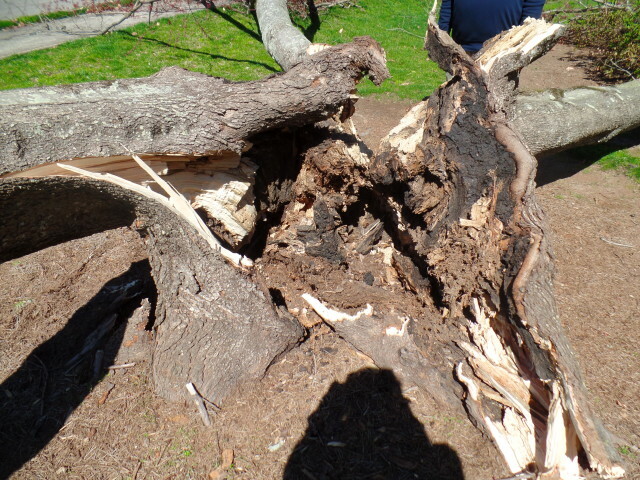 Whole tree failure is not as common as canopy failure, where large branches and limbs break off during storms. There are several different causes for canopy failure. Certain trees with large, leaf bearing canopies are more likely to fail in high winds than others. A tree’s form is also a common factor for limb and branch failure. Many homeowners never perform any structural or maintenance pruning. This can also contribute to failure. Trees with co-dominant or multiple leaders are often unable to withstand high winds, snow, and ice. Where the co-dominant leaders meet can typically have included bark, this occurs at poor unions and becomes areas for decay. Decay is another factor to limb and branch failure. Any wound in the bark whether created by insects, birds, people, or any other reason can be an opening for fungus to begin to grow, thus weakening the wood. Decay can occur anywhere from the roots to the base, the trunk and up through the canopy. A tree may appear to the owner as in good health because it has green leaves or pretty flowers this year but it may be in poor condition and present a hazard to the site. Educating tree owners on poor structure, decay, and the risks that follow may help keep their homes, families, and property safe. Regular inspections of your trees by a trained arborist is the best insurance for minimizing risk. It is easy after a tree falls to say why it failed. But being proactive in prevention will pay off in the future, keeping your trees healthy and safe and saving you the cost of emergency tree care. ← Heath Tree Service Visits Boise!